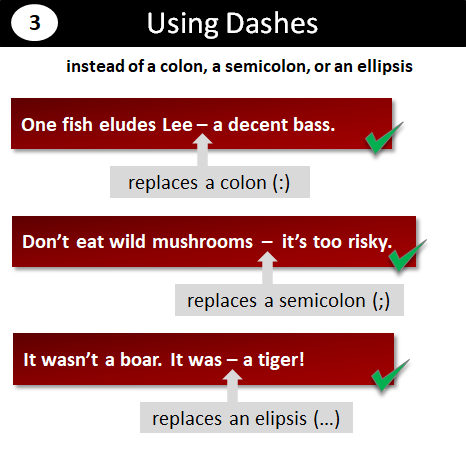 This page offers an explanation on the correct use of dashes and gives examples of dashes used in sentences. It depends — as my mother used to say — on trust. World War II ran 1939–1945. Generally speaking, the dash does not have a unique role. It is usually used as an alternative to another type of punctuation. When used to extend a sentence, a dash can replace a semicolon (;), a colon (:), or three dots (...) used as a pause for effect. When used as parentheses, dashes are alternatives to brackets or commas. As dashes do not feature on a standard keyboard, lots of people use hyphens instead of dashes. That's not really such a crime, but it's something of a missed opportunity to show off that you know the difference between a hyphen and a dash. Some writers like to use two hyphens (--) to represent one dash to differentiate. Here they are again but in a bigger font size. The hyphen and the en dash are almost indistinguishable from each other when using normal size fonts. USSR existed between 1922 and 1991. USSR existed from 1922 to 1991. USSR existed 1922 to 1991. The project will be delivered January-June. Note: If you're a stickler for the rules, use an en dash between times and dates. You will get away with a hyphen. Do not use an em dash. Note: If you're a stickler for the rules, use an en dash in your adjective. You will get away with a hyphen. Do not use an em dash. She demanded just one thing from her students: effort. She demanded just one thing from her students — effort. She demanded effort from her students. That's all she ever asked for. She demanded effort from her students; that's all she ever asked for. She demanded effort from her students — that's all she ever asked for. As she prodded through the sludge, something caught her eye. It was the unblemished unmistakable sparkle of the diamond on her grandmother's ring. As she prodded through the sludge, something caught her eye. It was the unblemished unmistakable sparkle of — the diamond on her grandmother's ring. Good news! There are specific rules about when to use a semicolon, a colon, or three dots, so you have to know what you're doing if you choose one of them. One of the good things about a dash is that it can be used as a substitute for all three. Note: If you're a stickler for the rules, use an em dash to extend a sentence. You will get away with an en dash or a hyphen. Mark Jones (who has lived in our village for 20 years) is the world Scrabble champion and the national Cluedo champion. Mark Jones — who has lived in our village for 20 years — is the world Scrabble champion and the national Cluedo champion. Mark Jones, who has lived in our village for 20 years, is the world Scrabble champion and the national Cluedo champion. Last week, Dr Mark Jones — a resident of Bexley since he graduated from Bexley Secondary School in 1990 — was crowned, for the second year running, the world Scrabble champion. You don't need to justify using dashes for parentheses, but just be aware that they can look a little stark. Note: If you're a stickler for the rules, use an em dash for parentheses. You will get away with en dashes or hyphens. 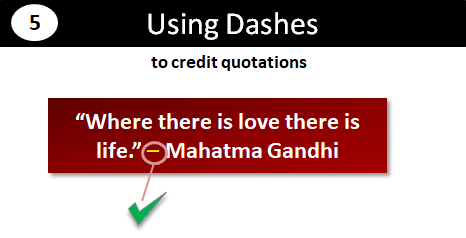 Note: You have to use an em dash when crediting a quotation. An en dash or hyphen looks wrong. Skip — a guard dog for Bonds Ltd in Bury — hospitalized�two burglars before returning to eat the steaks they had thrown him. Skip—a guard dog for Bonds Ltd in Bury—hospitalized�two burglars before returning to eat the steaks they had thrown him.